Mix Fuller's Earth (multani mitti) and rose water (gulab jal) and use this as a face pack. This will keep your skin clean, cool and help remove blackheads. Take 1 tsp lime juice mixed with 1 tsp of finely powdered cinnamon. Apply at bed time and wash in the morning. Make a thick paste of curd and black pepper. Apply this on affected areas. Wash with cold water after 10 minutes. Make a paste of cucumber and apply on your face. Once it dries, wash with cold water. Applying a paste of sandalwood powder, turmeric powder and rose water is also very effective in removing blackheads. Take 1 tsp of fresh coriander leaf juice with ½ tsp of turmeric powder. Apply this at bed time and wash it in the morning. Repeat this for a week. Applying a paste of Fuller's Earth, almond powder and glycerin soap is very effective. Blackhead remover strips can also be used. But consulting a skin specialist before using it is advised. Never squeeze blackheads because it can cause skin infections. Try avoiding oil-based creams and moisturizers. Use mild soaps and cleansers to keep your skin oil-free. Consult a doctor for proper guidance. Use minimum make up. Make sure to clean your face before going to bed as it might clog the skin pores. Drink a lot of water and fruit juice to keep your skin hydrated and healthy. Have sufficient amount of sleep. It is very important for a healthy skin. Use herb-based antibacterial soaps, face wash and other cosmetics. Always use clean towel and pillow. They play an important role skin health. Avoid oily food and go for fresh fruits and vegetables. 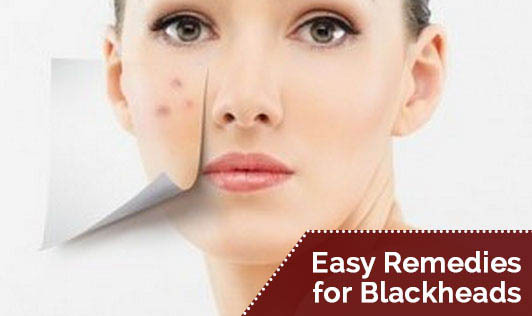 Blackheads are caused due to various reasons. But getting rid of them is not very hard. Consult a doctor for further information and for the right treatment.